Studying the way light gives energy to atoms and molecules for chemical reactions is nothing new for chemists, but Dr. Jay Foley brought something unique to the lab table. He studies how, in some circumstances, light merges with molecules to create a hybrid, and how this can be lead to positive progress for humans and the environment. In February, Foley won the Cottrell Scholar Award for his research in studying the effect nanostructures have on light in situations where atoms and molecules merge with light to create hybrid structures called polaritions. Cottrell Scholar Awards are given to college professors who show significant commitment to bringing scientific research into teaching with a long-standing record of accomplishments. The awards provide grants to fund research and also fund teaching. Each recipient is awarded $100,000. Dr. Foley’s current lab tries to figure out how to control light so that it merges with atoms and molecules. The light-molecule hybrids created from this process have special properties that can be used to make new molecules, or to make known molecules more efficiently. There are many potential uses for this research. “There’s an abundance of solar light, so if you can do useful things with solar light, like making chemicals you want, like chemicals for medicine or fuel, instead of pulling high energy fuels, you’re using abundant solar photons instead of typical chemical reagents,” Foley said. Chemists can use solar photons in this way to reduce the amount of carbon dioxide in the air by transforming it into something useful. The reactions Foley’s research works on creating can also produce high yields, which means most of what is produced in the reaction is what the scientist will use. Very little waste is produced, which is a challenge chemists often face. 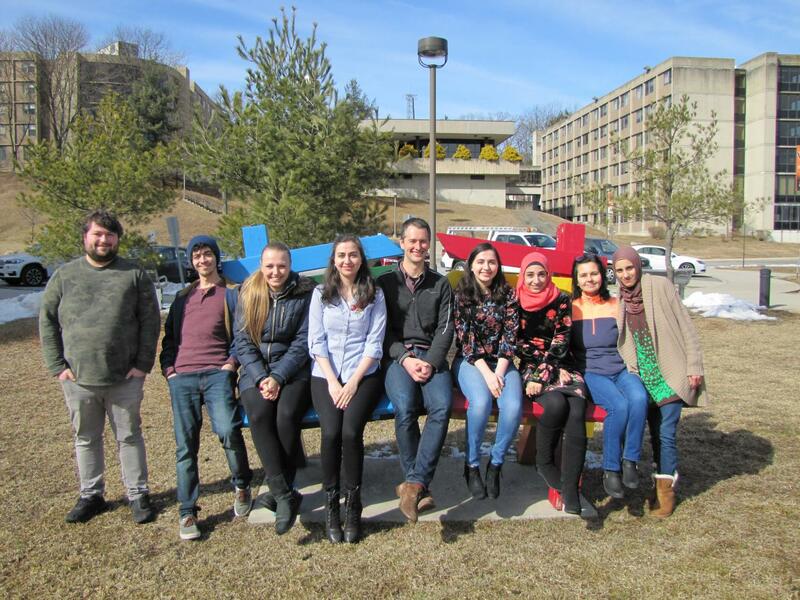 Dr. Foley’s current lab includes four undergraduate students and three master’s students. The lab has two main points of focus: how light can be converted into heat, and how heat can be converted into light. Both observe how light interacts with nanostructures. The participants in the lab work with Dr. Foley to develop tools that simulate materials with these properties. Together, they have developed WPtherml, a software package that serves as a design engine for these materials. Dr. Foley got his bachelor’s degree at Georgia Institute of Technology and his doctorate in Physical Chemistry at the University of Chicago. He did his post-doctorate training in Argonne National Lab, where he worked at the Center for Nanoscale Materials. He did theory and modeling in chemistry and physics. Foley said he had an “instinctive draw” to chemistry when he choose it as a major in college. His education started with experimental chemistry, but he realized he wanted to pursue theoretical chemistry after learning about it at the end of his sophomore year. Theoretical chemistry is the interface between math, physics and chemistry, and uses the basic rules of chemistry to figure out the properties of different materials. As a professor, Foley said he does a combination of everything he has done in the past. Dr. Foley’s newest student, Figen Suchanek, joined the lab this spring. Suchanek, who is working on her master’s degree in materials of chemistry, decided to work with Foley because he did a lot of modeling in material chemistry. She was quickly impressed with his extensive academic background and teaching skills. Suchanek said that, although Foley has on-paper office hours, he’s always available to come to for help. Suchanek also described Foley as very bright, friendly and gentle. She holds master’s and doctorate degrees in chemical engineering. Her current research focuses on modeling light-initiated energy transfer between metal nanoparticles and molecular adsorbates.